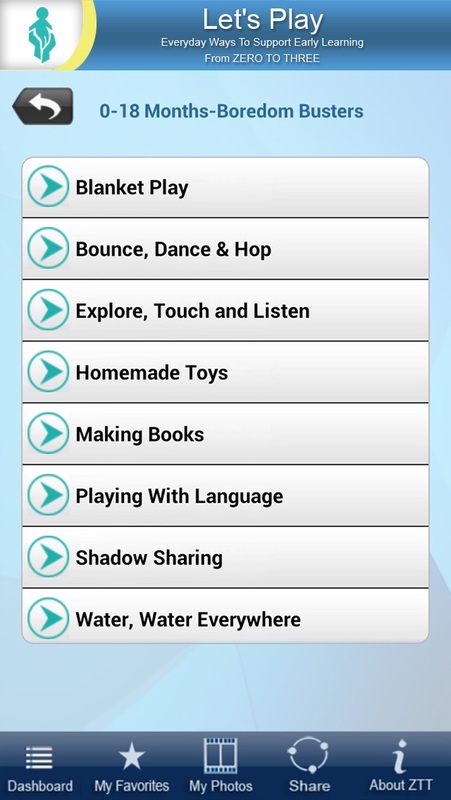 Excellent App to Help Foster Child Development and Build Relationships! ! I like that this app provides developmentally appropriate ideas for a range of young children from birth up to 5 years of age. I reviewed it from an early childhood educator/special educator perspective and a parent perspective. I think it is great and it covers so many developmental areas to include motor skills (gross and fine motor skills, strength building, coordination and balance, sensory exploration), language development (vocabulary and basic concepts), early literacy skills (initial sounds, rhyming, sound play, and a variety of book skills), early math skills (counting, 1:1 correspondence, and shape identification), cognitive skills (cause and effect, imagination, creativity, sorting/matching, categorizing, listening skills, and problem solving,), social skills (imitation, turn taking, cooperation, and conversational skills), and the development of self (confidence, self-esteem, independence, choice making, self control, and name recognition,). This app gives you fun, practical, and inexpensive ideas that you can use right away to foster your child's development. Some of the suggestions require some preplanning and the creation of materials, however the benefits to your child are completely worth the time and effort you will put in not to mention relevant to your child. Just the interactions you have with your child as a result of these ideas will make a world of difference for both your child and your relationship with you child. 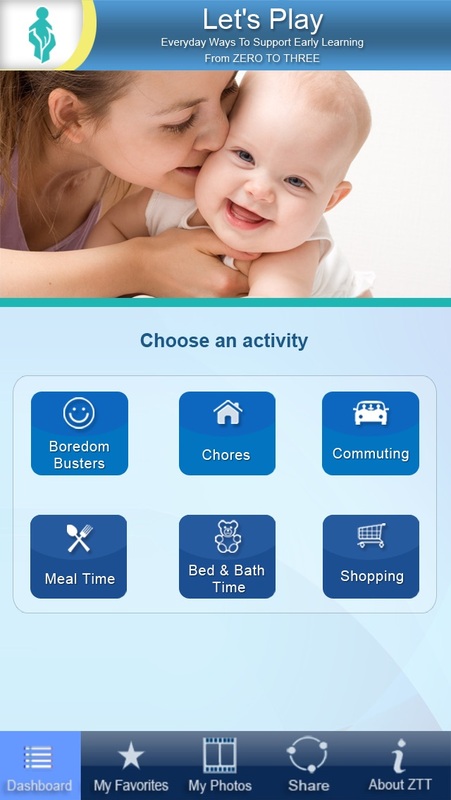 I love that this app is an idea generator for parents rather then an app for young children to use themselves as it is designed to generate ideas for adults during a variety of daily tasks (boredom busters, chores, commuting, meal time, bed and bath time, and shopping). I would highly recommend this app to all my families and in fact have already shared it with them! Thank you! Good start! Reading through to see if I would share this as a resource for our on site corporate child care. Nope, not yet, our early childhood experts are disappointed. Screen time STILL is not recommended for young children my the AMA, especially the 0-18 month olds. Better to SING with a baby in a car. And where is the book play? Let's add a chapter on that. Really lacking in open ended exploration and imaginative play prompts. This app has a lot of great ideas for interacting with your kids. I like that the photo function matches the pic with an activity.